The Exceptional Technical Highlights Regarding the Quality and Ethical Basis of Our Work and Production Standards! We have an extensive catalog and also create custom exhibits and exhibitions. In addition we create totally new innovations and R&D in house. 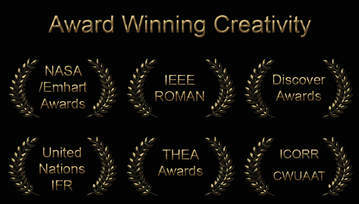 In all of these aspects we are world renowned, awarded and academically published. We have the longest warranty in the industry; 7 years against defects in workmanship compared to most companies that only offer 6 months to a year. Our exhibits have a long service life expectancy, with many units still functioning smoothly since we began selling our own exhibits to others in 2000. Technically we have been building exhibits for ourselves since 1981. They are so easy to maintain and repair, that it usually takes regular museum staff only 15 to 20 minutes. No other company in this line of work can claim this as a standard. Our decision to sell to other museums on a regular basis in 2000 was based on our desire to help extend our educational services on a global level and to help generate funding for our humanitarian and environmentally based R&D which is awarded by NASA/Emhart, Discover and others, both for the technical quality and for the idealist nature of the work. We do not use pressed wood (MDF) which is a weaker material that other exhibit companies often use. We only use lumber sources that have responsible forestry standards and that use low VOC glues, which are often soy based and made with quality ply. Our glues and paints are also Low VOC. This means that allergens are reduced in the end product as well. We also use RoHS compliant parts (electronics and electrical). In the US this has not been required as a standard, but we work in every possible respect to be a low impact and sustainable source and eliminate toxins from shop work and end products as a moral and educational initiative. In cutting, lathe and tapping operations we only use biodegradable nontoxic cutting formulas exceeding required safety standards. Our exhibits are also made to help work with people with disabilities and with available options to increase these elements. Designs are well defined with high contrast. Black and white, colors and metals and cases have clear understandable terminations of case structures and designs. The cases are also designed to have inclined controls to help them be usable from a seated position. We also offer voice options for all of our exhibits for those who cannot read or see well. Graphics are also made to be clear and concise with simple notations. In these respects and more we address some of the needs of people with low vision, hearing loss, cognitive disability and some degrees of paralysis. We are award winning and University published in these respects and more. Each member of our staff has some degree of disability but excels with exceptional quality and incredible productivity. We have a keen awareness and concern for others and for sustainability in everything we create. This is a link to learn more about the European RoHS directive and other factors regarding the responsible creation of electronic and electrical devices. (No lead being one of many key factors). We use the finest materials and also engineer extra strength into everything we make. The exhibit cases for the robotics are for instance industrial grade framing materials. Everything we make is also done with a high percentage of derating factored into all the engineering. Derating is part of how the exhibits last so long, but it does ironically make the work vastly less profitable for us. We are more concerned with long term value and low maintenance, which is old world craftsmanship combined with new technology. The basic way this is done is that every component for each exhibit is engineered to be much stronger than required. In electrical terms for instance we select switches that will work for 50,000,000 million cycles (mechanical specs) instead of conventional ones that can be 10 million or much less, power factors are also lowered so components are only exposed to a much lower percentage of their load capacity. (Basic example: Running a light bulb at 70 percent instead of 100 renders longer life.) Mechanically the same things apply as well in application of mechanical engineering. As a result everything is overbuilt and the results are incredible durability and longevity. We use this method for every part to we reduce loads to a much larger degree than would ever normally be done in industry to increase the effect. (This article is a limited commentary on derating which mentions the basis of what is a truly vast technical subject of quality engineering encompassing thermodynamics, current, voltage, mechanical stress, friction and others key points of engineering and testing). We do the absolute exact opposite of this next term as we want to know that 20 years from now you can still use the exhibits, have them be beneficial and find parts easily. We handcraft for quality in a disposable age. We make a product last and stay relevant so it does not enter the landfill and can help more people. Applying this to all production is very challenging, but well worth the effort as we can feel content in knowing that we are helping in both the short term and long term. No other company has this level of commitment in this line of work combined with R&D development with respects to all aspects of operation, end product and user adaptability. Almost all of the robotics exhibits have been designed to show how they operate, to be visible to the users which relates well to STEM education and to an extent higher education. They are visible in the respect that most of the mechanical, electromechanical and electrical parts are view-able in operation so students see exactly how they work. All interactive exhibits (other than robotics) have these options to allow viewing of the internal workings as well, but for the non-robotic interactive exhibits we can specify the available options for these elements. Each exhibit is handmade as a technological work of art & science. When an order is made we also inquire about the color choice. We offer as part of the exhibit cost, colors from a standard selection of Formica, Wilsonart and sometimes Pionite. Color choices can be made after the order is placed as long as it is before the case panel fabrication stage of the project.